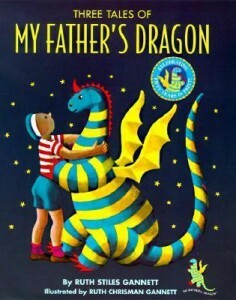 This month I’m veering away from the children’s picture books that I typically recommend in order to bring you Three Tales of My Father’s Dragon. Although this early chapter book may lean more toward adventure than inspiration, it still deserves a place on the Inspirational Book Finds list. Author Ruth Stiles Gannett wrote not one but three fantasy tales about a boy and a dragon. In the first, our young hero is off to save a baby dragon. The boy must use strategic thinking and clever problem solving skills in order to outsmart the dragon’s captors. How does one travel past a grumpy gorilla? With six magnifying glasses of course. How about crossing a bridgeless river? Feeding lollipops to alligators should do the trick. With a splash of silly humor and captivating black and white illustrations throughout, we keep wondering what tools the boy might pull from his backpack next. Adventures continue in the two remaining sequels. What a treat that the complete trilogy is packaged together into the same book. Each time the boy is faced with an obstacle along his journey, he doesn’t stop to think “uh oh, this is going to be a problem.” He simply gets to work thinking of a creative solution. Sometimes the challenge is too big for one person so he enlists the help of his friends, formulates a plan and takes action. From My Father’s Dragon I learned that you have to use your noodle – and that the underdog can triumph in the end. Three Tales of My Father’s Dragon is a great one to read aloud to K-1 students and independently by second graders on up. Find more Inspirational Children’s Book Finds here.